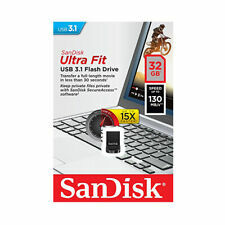 SanDisk Cruzer Blade 32GB USB Flash Drive Large Capacity New Unopened Pkg SALE! 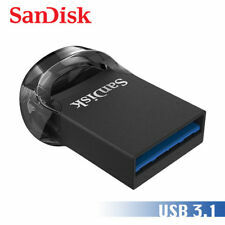 USA Seller = Fast Delivery.100% Genuine SanDisk !!! Trending at $7.90eBay determines this price through a machine learned model of the product's sale prices within the last 90 days. Brand New Sealed Retail Pack. USA Seller- Ships Fast !! $A compact, plug-and-stay, high-speed USB 3.1 flash drive that's ideal for adding more storage to laptops, game consoles, in-car audio and more. Read speeds up to 130MB/s. Write up to 15X faster than standard USB 2.0 drives. Move a full-length movie to the drive in less than 30 seconds. Your files will be secured with 128-bit AES encryption to help keep them confidential, even when sharing the drive with others. SanDisk SDCZ48-032G Ultra. With its sleek black design, the SanDisk Ultra USB 3.0 Flash Drive is as stylish as it is practical. Product Details: SanDisk Connect Wireless Stick is the flash drive reinvented to work not just with your computer, but also with your phone and tablet. With the SanDisk Connect Wireless Stick in your pocket, in your bag or across the room, you can wirelessly access your media and transfer files, stream HD videos and music, and save and share photos and videos to and from your mobile device. Delivering up to 32GB of extra capacity, the SanDisk Connect Wireless Stick empowers your mobile lifestyle - whether you're running a sales meeting or taking a hike in the woods. SanDisk Connect Wireless Stick lets you stream video or music to as many as three other devices at the same time, or gives you access to all your stuff from the pocket of your jeans. $HIGH-SPEED USB 3.1 PERFORMANCE IN A USB TYPE-Câ¢ DRIVEEasily free up space on your smartphone or quickly transfer files between devices at USB 3.1 high speeds of up to 150MB/s. 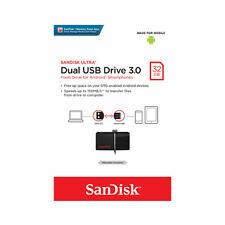 With a reversible USB Type-Câ¢ connector and a traditional USB connector, the SanDisk UltraÂ® Dual Drive USB Type-Câ¢ lets you quickly and easily transfer files between smartphones, tablets and computers. Plus the SanDiskÂ® Memory Zone app for Androidâ¢ (available on Google Playâ¢) helps you manage your deviceâs memory and your content. The SanDisk Ultra Dual Drive USB Type-C is the perfect liaison between your new USB Type-C device and your devices with traditional USB ports.FEATURESSPECIFICATIONSInterface :USB Type-C and USB Type-A connectors; USB 3. Whether traveling the world, hanging out with friends, or creating special memories with loved ones, being able to store precious moments digitally keeps them handy and safe. SanDisk 32GB USB flash drives offer space for video, audio files, business presentations, photos, and much more. What are the specifications of SanDisk 32GB flash drives? Security: SecureAccess software creates a folder on the drive that's password-protected with 128-bit AES encryption. Store any files there you want to keep private. Slim: If you're on the go a lot, compact plug-and-stay models slide into your laptop or smart phone and maintain a smooth profile. This helps avoid snags or accidents in transit, and fits easily inside carrying cases. Storage capacity: 32GB of memory means room for approximately 4,000 high-resolution photos, 8,000 songs, or four hours of full HD video. Protection: Retractable drives offer extra protection from scratches and damage while bouncing around in your purse or pocket. What platforms does SanDisk support? PC: USB type 2.0 and 3.0 flash drives are compatible with Windows 10. Some models are compatible with Windows Vista as well. Apple: iXpand 32GB storage drives use a Lightning connector to link with Apple iPhones and iPads. This lets you free up precious hard drive space. The flexible Lightning interface slides through many cases so you don't need to remove the phone or tablet from its holder. Android: Dual-type 32GB flash drives have a standard connector on one end, and a micro-USB interface on the other that attaches to many Android smartphones and tablets. After downloading the files you want, slip the USB drive into your laptop to transfer them quickly. USB Type C: Type-C ports are smaller than standard connectors and reversible, meaning they're never upside down. 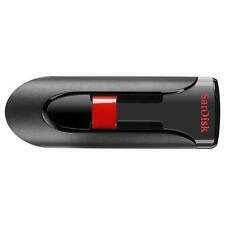 How fast are SanDisk USB flash drives? Standard USB 2.0 drives have a maximum transfer speed of 60 Mbps. USB 3.0 drives offer maximum speeds of up to 640 Mbps. This can provide data transfer rates that are 10 times faster than USB 2.0 models. Are SanDisk USB 3.0 flash drives backward compatible? USB 3.0 storage devices work with both 2.0 and 3.0 USB ports. 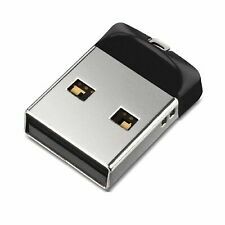 The USB flash drive's transfer speed depends on the device port you connect it to. for instance, laptops with USB 3.0 ports offer faster speeds than 2.0 ports. Content provided for informational purposes only. eBay is not affiliated with or endorsed by SanDisk.